The Kremlin pulls together an anti-NATO bloc. Minsk is trying to be helpful to the West as a source of information about the Kremlin's plan towards Ukraine insofar as Vladimir Putin allows them to. The Russian elite is overtaken by chauvinism and are increasingly losing touch with reality. Belarus and Russia will jointly explore space. The number of those who want to serve in uniform in Belarus is declining steadily. China becomes Belarus' No. 2 military and industrial complex partner. On 8 May, a truncated summit of the Collective Security Treaty Organisation (CSTO) took place in Moscow without the participation of the President of Kazakhstan. The parties brought up the topic of the West's sanctions against Russia. It suggests that one of the goals of the meeting was to discuss ways to circumvent them using Moscow's usual clientele in the post-Soviet space (Armenia, Kyrgyzstan, Tajikistan and Belarus). Interestingly, the leaders of these countries were invited to visit the Russian National Centre for Defence Management: Moscow may have wanted to impress its guests by demonstrating its power. And to hint at the same time that there were offers on the table that should not be refused. Apparently, the Russian leadership got what they wanted: all of the post-Soviet leaders in attendance once again publicly confirmed Russia's regional leadership and prioritised collective security in the framework of CSTO. The summit of CSTO member states on 8 May in Moscow may indicate Russian leaders' plan to forge a kind of anti-West bloc of post-Soviet countries, each of which will be backed by Russia. If this is the case, then Vladimir Putin is playing a dangerous game directed at exacerbating the situation in the region by trying to transform the opposing 'NATO – Russia' forces into 'NATO – CSTO'. As a result, Eastern Europe and possibly Central Asia may face serious challenges to its security and, more concerning, unknown military challenges. The Belarusian leader made an offer to Moscow to help coordinate its policy towards Ukraine. In this case, it means that Moscow would need to inform its formal allies about its plans regarding Kyiv. Alexander Lukashenka's proposal, voiced during the summit of CSTO member states, about becoming the coordinating force with regards to its policy towards Ukraine should be considered in light of his April conversation with Polish Prime Minister Donald Tusk. Through coordination (i.e. getting information about the Kremlin's plans with Ukraine) Alexander Lukashenka will try and influence Vladimir Putin in order to stabilise the situation in Ukraine and to improve, inter alia, his chances to resume a dialogue with the West for his own sake. It can include the exchange of information regarding the Ukrainian crisis. 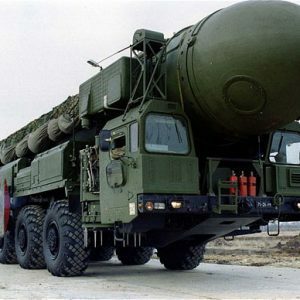 Russian Nukes in Belarus: A Provocation or Warning? One of the most high-profile events in May was the declaration made by Frants Klintsevich, Deputy Chairman of the Defence Committee of the State Duma, on 7 May 2014. According to the Russian parliamentarian, Russia may start "moving our weapons closer to its borders" including the border between Belarus and the EU in retaliation to the permanent deployment of NATO troops in Eastern Europe. There was a hint that there is a possibility of deploying Russian nuclear weapons in Belarus to be used against NATO sites. This statement has received no further development. It remains an open question remains who precisely dictated Mr Klintsevich's statements: was it a gaff expressing the mood of a segment of the Russian elite (most likely, it was) or was it a deliberate statement designed to probe public opinion? The statement of Russian MP Frants Klintsevich sheds some light on the chauvinist hysteria that has seized Russian society and its political elite as of late. This is particularly disconcerting for Belarus. It should be noted that, while it may seem paradoxical, Russia was the main source of 'Westernisation' of Belarus, including through its mass media outlets. Now even this is under jeopardy. Cooperation between Belarus and Russia in space exploration has the potential to expand. The cooperation between the Federal Space Agency of Russia and the National Academy of Science of Belarus marches on. The first meeting of the joint working group on drafting space exploration programmes took place in Minsk. In total, the Russian delegation suggested 12 new areas of cooperation. The remote sensing of Earth has been, and will remain, one of the key areas of cooperation. Since 2012, there has been a joint space team dedicated to carrying out the remote sensing of Earth that utilises Russian and one Belarusian satellite. Although Belarus is not among the world's leading forces in space exploration, Russia remains interested in their cooperation. If the West imposes sanctions involving the restriction of exports of goods related to space exploration to Russia, the importance of Belarus for the Russian space industry will increase significantly. If for no other reason than currently the share of components of Russia's own production in the Russian spacecraft accounts for only 27% of its manufactured goods and they account for about 96% of all of their space programmes' failures. On 13 May, a Chinese military delegation met Siarhiej Huruliou, Chairman of the State Military Industrial Committee. The parties noted that the military and industrial cooperation remained an important factor of the comprehensive strategic relations of our countries. They also discussed several promising areas of cooperation and expressed their interest in further strengthening their cooperation in this field. The meeting took place in the framework of a 'road map', which defined the main areas of cooperation, including the military and industrial sphere for 2014 – 2018. On the same day, a meeting between the Belarusian Minister of Defence Yuryj Zhadobin and the Chinese delegation took place. According to the press service of the Ministry of Defence, the parties discussed issues related to the development and strengthening of the bilateral military cooperation. The authorities acknowledged the fiasco surrounding last year's admission campaign to the Military Academy. As it was publicly announced only in May, during a meeting on improvement on the system and admission work to universities and colleges held on 11 March and chaired by Alexander Lukashenka, Major General Siarhiej Bobrykau, Head of the Military Academy, noted that admissions had only taken in 65% of the number of students necessary in 2013. Even in the 1990s competition for admission to the nation's military schools was more than two heads for everyone one available spot, and for some specific fields it was over 15 people for a single place. Last year, the Military Academy had to enrol students from among those applicants who had failed their entry exams. As a result, many among them were later expelled because their poor academic record. 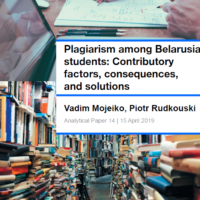 The Belarusian Interior Ministry is still trying to find a long-term solution to the problem of their ongoing shortages and to increase the quality of how it goes about selecting its applicants who enter its schools. They hope to attract only those who seriously intend on dedicating their life to a career in law enforcement. They even plan to create legal studies courses in secondary schools. As envisioned by its initiators, this will raise the number of students who are motivated to choose a path working with the law. However, it is not so clean-cut in practise. There are already 58 schools that have specific courses in law and they are attended by 3,900 students. The Brest region leads the country with 40 courses in law and 823 students attending them. However, only one third of the students choose the legal profession upon leaving secondary school. On 12 June, Alexander Lukashenka completed his populist tinged visit to Serbia. The visit showed that Lukashenka is able to easily bypass the visa restrictions placed on him by the EU, and some partners of the West still consider him a friend. However, Belarus and Serbia lack any true common long-term interests, so the prospects for political cooperation between the two parties looks rather hazy. Lukashenka and his Serbian colleague Tomislav Nikolic both maintain a pro-Russian orientation, but have chosen different paths for their countries. During his visit, the Belarusian head of state had several high-level meetings, received a medal from the Serbian Orthodox Church and stuck to his habitual rhetoric. In particular, Lukashenka made a surprise announcement that he had intended on transferring several S-300 anti-aircraft missile systems and jet fighters to Milosevic back in 1999. This high level visit, despite the accompanying publicity surrounding it, did not yield anything practical. However, as the two nation's economic ties continue to gradually evolve, Lukashenka and Serbian tycoons like Dragomir Karych are pushing for further cooperation between the two countries. 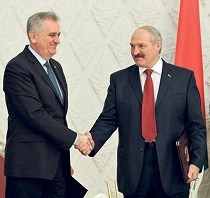 On 12 June, Alexander Lukashenka wrapped up his visit to Belgrade. Although the Belarusian state leader met with Serbian President Tomislav Nikolic and Serbian Orthodox Patriarch Irenaeus, the visit appears to have been largely fruitless. If it were not for the loud and blatantly provocative statements that Lukashenka made before and during the visit, it would have remained far less noticeable. On the eve of his trip to Belgrade, the Belarusian head of state gave an interview to the Serbian press. He stated that he had intended on providing Serbia with Belarusian S-300 missile systems and jet fighters in 1999 before NATO operation, but Milosevic refused to take him up on his offer. While these words were certainly relished by a segment of Serbian nationalists, they brought little in the way of benefits to Belarus. On 12 June, Lukashenka also was keen to point out that "the West was willing to do everything to disrupt his visit to Belgrade". Despite his exaggerations, his trip to Serbia caught many by surprise, as Serbia previously supported EU visa restrictions against the Lukashenka’s regime. Generally, the Belarusian leader talked more about the past, and had little to say about future. He spoke on the NATO bombing of Serbia and Serbia's geopolitical vision, things which have retreated quietly out of the sphere of public discourse over the past 15 years. While receiving the highest award of the Serbian Orthodox Church from Patriarch Irenaeus for his non-recognition of Kosovo and Belarus' support in 1999, Lukashenka promised never to let Serbs down. The Serbian Orthodox Church gave has also rewarded this medal to the former head of the Russian Orthodox Church Alexey II and Russian Nobel laureate Alexander Solzhenitsyn. Lukashenka's words resonated among many Serbs, who for the most part hold a positive view of Lukashenka and believe in Belarus’ pronouncements of solidarity. Indeed, Belarus sent rescuers and humanitarian aid following the recent floods in Serbia. Both countries used the visit to demonstrate their defiance towards the dominant regional political entities. Nikolic is bargaining hard to get more favourable terms in Serbia's relations with the EU, while showing that he has other partners outside of the West. Lukashenka's visit to Belgrade shows that European Union visa sanctions have failed. Serbia joined in imposing EU travel restrictions against the Belarusian authorities in 2012, but one year later Tomislav Nicolic reneged on his commitments and visited Minsk. Lukashenka's regime has managed to circumvent EU sanctions in large measure due to the quirks of Nicolic' personality, and not on the strength of Belarusian diplomacy. Nikolic remains grateful to Belarus for its support of Serbia over the Kosovo issue. It would appear, judging by recent and past statements, Lukashenka’s regime is even more iron-willed in his determination not to recognise the independence of Kosovo than even the Serbs themselves. Nikolic remains congenial to both Moscow and Minsk. In 2011, then Chairman of the Serbian Progressive Party, Nikolic attended Lukashenka's inauguration ceremony. The ceremony, of course, was mired in controversy as only a month prior the Belarusian authorities brutally dispersed protests and shipped off to prison nearly all of the other presidential candidates. Their respective mutual economic interests would appear modest at best. Their trade turnover hovers around $200m annually, though in 2007 it took a noticeable dip and fell to $54m. Several Serbian entrepreneurs remain interested in developing closer ties with Belarus, particularly a handful of tycoons. The Serbian press has reported that Miodrag Kostic, who is alleged to have invited Lukashenka to take a holiday in Serbia in 2009, among them. For the duration of their stay, Lukashenka and 150 strong entourage lived in a hotel owned by Kostic. Another Serbian businessman, Dragomir Karych, formerly known as Milosevic's banker, became an Honorary Consul of Belarus in Serbia in the autumn of 2013. He also served as the chairman of the Belarusian Chamber of Commerce in Serbia. Working with his brothers, Karych lords over several large investment projects in Belarus, including the construction of a large housing/business complex named the Minsk Lighthouse, an elite district in the Belarusian capital. Serbian tycoons themselves are often the organisers of high-level government visits, as good political relations help to generate more investment projects. Belarus and Serbia have a few striking similiarities – both of their leaders, for instance, are heavy on the pro-Russian rhetoric and their respective Orthodox Churches wield a considerable influence on society. However, they have embarked on decidedly different economic paths. This may be largely the fault of geography, as Russia is rather far from Serbia and has very little ability to influence its politics directly. Mediation is almost always first on the docket for any country that Belarus has established warm relations with who in turn themselves have good ties with the EU. However, in the case of Serbia, its president enjoys little support in Brussels. This visit is all the more striking considering the fact that Belarus does not require a mediator to negotiate with the EU at present and diplomatic channels are slowly opening up. Alena Kupchyna, Deputy Minister of Foreign Affairs, continues to spend a fair amount of time in the EU, meeting with her Western colleagues. Perhaps the most obvious reason for developing its ties with Serbia is to have them act as a bridge for new contacts between the Belarusian authorities and the nation's wealthiest businessmen. Despite all of the turmoil in Eastern Europe, Belarusian-Serbian relations are much more tied to specific economic interests than to abstract political ones. If Belarus needs new investors who are willing to negotiate with an authoritarian government, it appears that Serbia is ready to accommodate them.